The ‘Aina Pono Hawai‘i State Farm to School program has earned five-stars from some of its toughest customers: the students. “Who wouldn’t want fresh, locally grown fruits, vegetables and beef instead of canned food?” said one high schooler. 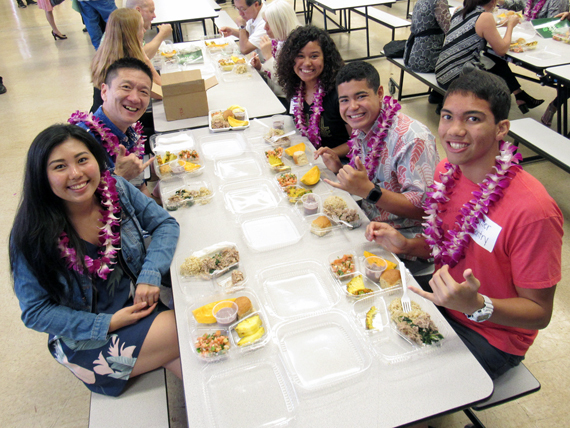 Chin and others see the program as a step toward Governor David Ige’s goal of doubling local food production and improving food security for the entire state. It’s a win-win for local farmers to expand demand for their goods while providing healthier meals for students. “We plan to expand the program to other schools and continue the ‘Harvest of the Month’ to highlight more local foods,” said Albert Scales, the Department of Education’s food services branch administrator. Private funders who have helped make the program possible include Ulupono Initiative, The Kohala Center, HMSA Foundation, Johnson ‘Ohana Charitable Foundation, Kaiser Permanente, The Dorrance Family Foundation, and the Hawai‘i Appleseed Center. It also recently received a $100,000 grant from the U.S. Department of Agriculture for expansion and training.